Intravascular ultrasound (IVUS) can provide useful information for vessel size and atherosclerotic plaque characteristics by cross-sectional imaging during percutaneous coronary intervention (PCI). In patients with chronic total occlusion (CTO) lesion, IVUS also can provide information about the lesion characteristics including atherosclerotic plaque morphology, vessel size, and lesion length and enable stent implantation properly. 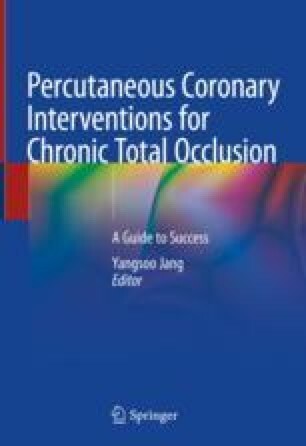 Moreover, using IVUS catheter, we can avoid PCI-related complications by appropriate sizing of the CTO lesion. In addition, IVUS is very helpful for wiring strategy for CTO intervention. In this chapter, we demonstrated the IVUS-guided wiring technique with the standard antegrade approach and with the more recent retrograde approach. IVUS could be used with each of these cases: (1) to find entrance of the CTO lesion, (2) guidewire penetration from subintimal space to true lumen, and (3) reverse CART technique with retrograde approach .